The change request was submitted by the MDI group to provide a vertical access shaft for the ILC experimental hall as well, so that the detectors could be assembled mainly above ground. One of the major changes on the ILC design laid out in the Technical Design Report (TDR) that is ongoing right now is a layout change of the experimental hall complex. A vertical shaft connecting the underground experimental hall to the buildings above ground will be added to the original plans. This change request was submitted to the Change Management Board (CMB) after the choice of the Kitakami area as possible construction site for the ILC. “I have written this change request in my function as leader of the MDI Working Group,” explains Karsten Büßer from the German lab DESY, who is also part of the team that is in charge of the implementation of this request (aptly named Change Implementation Team). 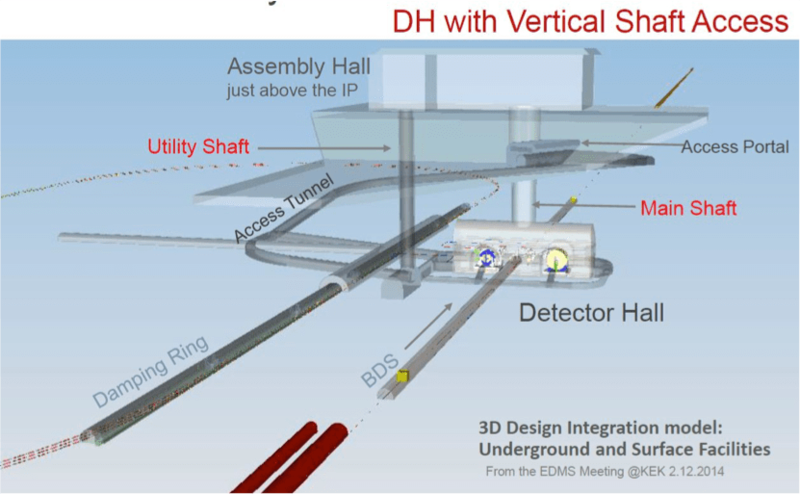 “Both the ILD and SiD detector groups want this shaft.” This shaft will be an important addition to the whole layout of the experimental hall complex. The ILC has two different detector groups working on further plans and improvements for the possible future detectors at the ILC. Both detectors will be placed in the same hall so that they can be moved into the interaction point in a push-pull configuration. Just like the accelerator, the whole interaction region and thus the experimental facilities are underground; meaning a plan to access these underground facilities was needed no matter where this machine would be built. The original design within the TDR foresaw an inclined horizontal tunnel to access the underground experimental hall. This was a design choice based on the question whether or not both halls – on the surface and underground – could be built on top of each other or not. “When TDR was published the Kitakami area had not been an option yet,” says Büßer. At this point it was unclear whether the machine would be built in Asia, the U.S. or even in Europe. Therefore it was essential that the TDR plans were as generic as possible to fit any possible site in any country on this earth. “For Asia it was assumed that most sites would be in mountains,” Büßer explains further. “There might have been a mountain peak above the interaction. On a mountain peak you can’t build any infrastructure to support the underground, so you don’t build vertical access shafts.” And even if it would have been possible to build support facilities on top of a mountain, the shaft would have been too long and probably too pricy to build. So to compensate for the lack of an acceptable possible vertical access shaft the horizontal tunnel was included into the plans. The formal change request for the addition of the vertical shaft has now been processed and finalised. Such an extensive change for the design of the machine of course means that a number of further questions come up. Moving things around in one place means changes in the overall layout of the whole facility. “For example another point which we have now on our to-do-list is to check the geological properties of the area for the new interaction point,” says Büßer. Relocating the interaction point within the Kitakami site by 800 metres has quite some impact. “We now need to take a test drilling to further investigate the geological properties in the depth of the experimental hall.” This test drilling should give the last needed clues for the new setup plan which is based on this change request. Not only the qualities of the underground but also the installation with in the planed support facilities of the surface need to be checked. The new layout includes a gigantic gantry crane within the surface halls (see picture). “The crane can lift masses up to 4000 tons,” says Büßer. The crane itself will consist of a massive gantry and the extremely stabile holding structure for the loaded goods right above the vertical shaft. It will also be movable along the size of the shaft to allow maneuverability of the hanging loads. “In the actual design concept for the hall we now have the vertical shaft which enables us to mostly assemble the detectors on the surface and then crane the remaining parts into the experimental hall for final assembly and later usage,” says Büßer. But they also kept the inclined horizontal tunnel for access to the damping rings and the hall. The new horizontal tunnel is smaller than in the old design since it is no longer needed as entry way for the heavy pieces of the detectors. It will still be used for smaller installations and transportation for smaller equipment into the underground halls. “We hope that the tunnel will be very helpful during the construction phase for the hall and for transporting most of the infrastructure which does not need craning,” says Büßer Another reason to support the vertical shaft is that even though the detectors could be assembled by bringing in the parts via truck along the tunnel, it would still be a lot of heavy lifting on a 10% inclination for the trucks which could have also caused problems. The tunnel will also always be an emergency exit for the detector hall without a lift or stairs. The International Linear Collider (ILC) is a proposed linear particle accelerator.It is planned to have a collision energy of 500 GeV initially, with the possibility for a later upgrade to 1000 GeV (1 TeV). The host country for the accelerator has not yet been chosen and proposed locations are Japan, Europe (CERN) and the USA (Fermilab). Japan is considered the most likely candidate, as the Japanese government is willing to contribute half of the costs, according to a representative for the European Commission on Future Accelerators.Construction could begin in 2015 or 2016 and will not be completed before 2026.